I am a ceramic artist transplanted here in 1965 from Rhode Island. I settled in Liberty (Gassaway), Tennessee 40 years ago on 165 acres where I raised my family and have my studio and sales gallery. My wall art consists of clay tiles that are handmade. They are either impressed with various plants and wildflowers before they dry or are carved when leather hard. The tiles are then fired in my kiln and sometimes stained. Lastly, they are smoke-fired in straw. The smoke-firing leaves straw patterns in the clay, and the heat from the fire changes the coloring. I enjoy the straw-firing technique and how it changes the appearance on the surfaces of the tiles. My wall pieces seem to fit in any décor, whether traditional or contemporary. In addition to my collection at Arlene’s Art Studio, my work can also be seen in several galleries in Tennessee and around the country. If you are interested in having a unique piece created for yourself or as a special gift for friends or family please feel free to call or email me. "I have had a love affair with clay for most of my life. My passion now is in creating unique ceramic wall art using wildflowers and plants." 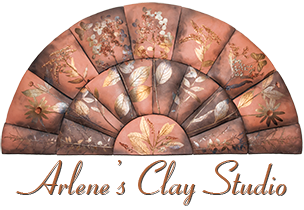 Arlene is an alumnus of the Appalachian Center for Craft in Smithville, Tn She is a sponsor and was a member of the Off the Beaten Path Studio Tour for 10 years. For nearly 30 years I have exhibited in many shows in Tennessee, Louisiana, Florida, Kentucky and even New York. I couldn't have done this without my John dutifully helping me. My first show was the second annual TACA Fair in Nashville circa 1972-73 along with some other students from Pat Beaver's clay class. We had not heard about craft shows at that time! We set up our wares on straw bales and hung clay chimes and beaded jewelry on barn wood panels. I am happy that I was a part of that era. Several years ago I began selling only through galleries and online. You may now simply email me to place an order and John will carefully pack it up for you!